Tuesday morning we packed up to roll out of Baker on our own. Bill, Pete and Susan wished good luck before we left and they packed for their return to Sacramento. 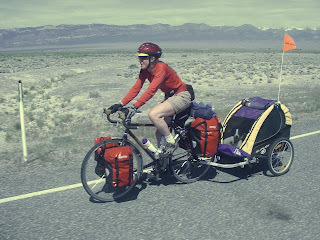 We slowly peddled out of town with heavy loads. We were going to split the next 85 miles into two days and dry camp at the top of Wah Wah Summit. We soon hit the Utah border and took pictures. Many friends have enquired about Jack and here is a picture of him riding in his chariot (the dog cart) as we ride towards Mormon Gap. We had two long climbs and the valleys in Utah seem so much bigger than in Nevada. There is also an interesting wind pattern to each valley. Descending from the pass we have a headwind, across the flat we have a crosswind, and ascending the pass on the other side we have a tailwind. After 52 miles we found our campground at the top of the pass. 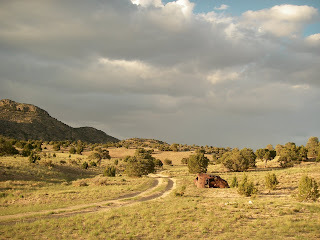 Here is a view up the dirt road from the highway. We listened to the weather radio and knew the good weather was changing again. This morning clouds filled the sky, we packed up and headed into the headwind on the descent from Wah Wah. At the bottom of the Wah Wah valley we were hit by tremendous side winds reducing our speed on the flats to 5-7 mph. Rain clouds, thunder and lightning could be seen on the San Francisco mountains ahead. We persisted and finally reached the point with a tailwind and made the 1400 ft. climb to Frisco Summit. The storm had passed over us with some light hail on the climb; however a very cold tailwind pushed us to Milford. 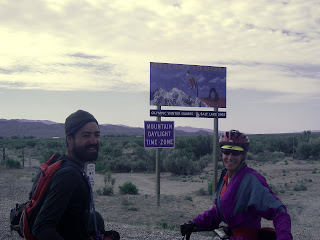 After we warmed up, we checked the weather radio and realized that we had just ridden through a major wind advisory for southern Utah and Nevada. Since I live in NM and do a lot of hiking in the desert mountains, I was wondering how you are dealing with what must be a significant dehydration issue given the weight of carrying water. Bill's part of the big bike ride ended... At least he was able to have some of the fun, but I bet you were sorry to see him go. Glad you met a new travel companion. The more the merrier! Especially now that it seems more remote. I just got home today from a week of vacation at Seco. Sunny days floating around the river, and lazy evenings playing cards! Perfect way to kick off the summer. Michael, well we do carry the heavy water. Most days we each have two liters on the bike, and a three liter bladder in the trailer. When we anticipate dry camping we carry an additional 2.5 gallons in a foldable jug. In the mornings and evenings we do significant rehydration (not counting beer). Hey Bob, I guess the instructions helped! Glad to see you commenting. Jack gets lots of attention and is making new friends everywhere. We have had better weather the last few days. Hi Leslie, Yeah, we'll miss Bill but he only has so much vacation. Our young friend John is a great kid. He's one year younger than Ben and reminds me of Ben in many ways. we'll probably ride together until we detour to Denver. He is riding to a job in New York and hopes to visit with his family in route so time is pressing for him. Glad you had a nice time in Seco. Did you see my friend Pat?